With its distinctive surf print and contrasting colour to the top edging and halter ties the Pour Moi Aloha Halter Suit is a surefire holiday winner. 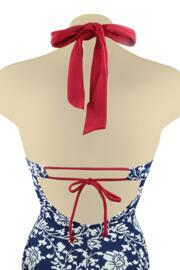 Featuring a bow to the centre front, keyhole detail and tie to the back. Surfs up! Attractive swimwear. The mint green and pink compliment each other. It’s roomy and comfortable to wear. The back is quite open so if you have a fatty back it will show the creases. This can be avoided by adjusting the strings at the back but then it’s a bit tight. I still kept it as it really is a lovely costume. I sent this back because the pattern didn't suit me. A beautiful swimsuit, fits perfectly. Colours are very eye catching and it stands out. 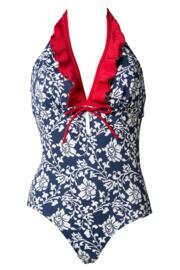 Very flattering swimsuit, I am hourglass shaped and this complemented my physique very well. Beautiful swimsuit, very flattering. Only slight criticism is the ties for the halternevk are very long. Not a big issue for me as I'm tall. Love it so much. Fits beautifully and is very flattering.